Since the redeveloped Thomond Park reopened in October 2008, the iconic and legendary venue has received widespread acclaim and recognition as a conferencing & banqueting centre of the highest international standard. The stadium, renowned for its award-winning design and architecture, incorporates an entire level in the east stand dedicated to an array of hospitality & conferencing facilities. The multi-functional design & layout can cater for all types of requirements from business meetings and seminars to large-scale conferences, receptions, and gala banquets. 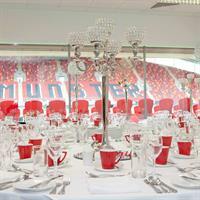 Thomond Park Stadium has all the facilities to host corporate social events, meetings, gala dinners, exhibitions, product launches, promotions, staff training to mention a few..
Our catering partner, Masterchefs Hospitality, is one of Ireland’s leading corporate and event catering companies and can cater for all size events.The Conferencing & Hospitality team are dedicated to the management and delivery of every event from start to finish, and offer an exceptional level of customer service to ensure that each event is an unrivalled success in this most unique sporting and cultural location. The spacious Thomond Suite can facilitate banquet style dining for up to 470 guests and up to 800 for theatre style conference events.